In some industries (e.g. food or cosmetics) there is a need to check viscoelasticity properties in fluids flowing through pipes while they are processed. There are contactless devices that can measure viscoelasticity using a wave coupling technique: a low frequency compression wave propagates through the sample to be characterised, acting as a volume palpation, while “reading” ultrasound pulses probe the sample in these various stages of compression. 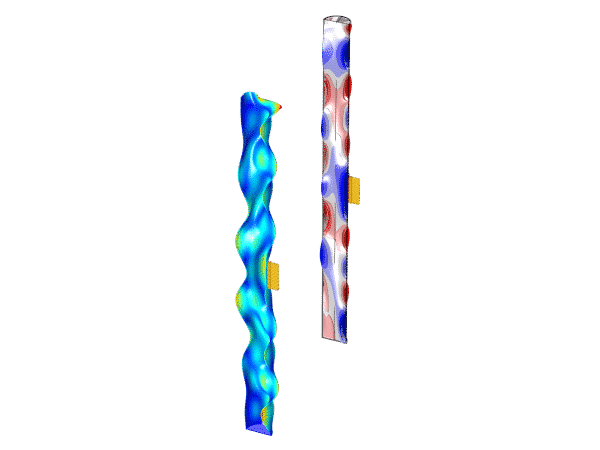 Simulation of acoustic and elastic waves can predict the vibration modes of the fluid and the pipe for different configurations that can be found in industrial applications: variation of designs (thickness, length, diameter, bended pipe, etc.) and use of different materials. It also helps to visualise and understand the behaviour of the pressure field during volume palpation in order to calibrate the ultrasound measurement and to optimise the viscoelasticity measurement. In both figures, a pipe filled with fluid is shown with its mechanical deformation on the left (scaled for visualisation purpose) and with the acoustic wave (palpation) in the fluid on the right. The source tranducer which is localised where the orange arrows point at. For a given set of materials and pipe dimensions, vibrations modes of the pipe and fluid can be very different for different frequencies, leading to different viscoelasticity measurements. Do you have a similar project? 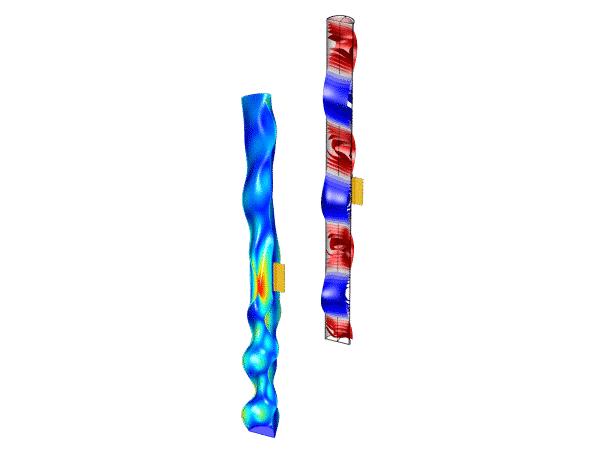 Our simulation expertise can help companies from industries such as Medtech (health), audio, sensors, energy and environment but also research labs that would need powerful simulation hardware and software. Contact us to learn more.